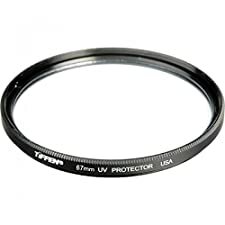 The UV Protector Filter from Tiffen protects your camera or camcorder's lens against dust, moisture, fingerprints, scratches, and damage. This filter can be kept on your camera at all times. It can also minimize the bluish cast sometimes found under daylight conditions. This UV filter's best function besides improving the quality of your images is the protection it provides for your lens. Kit Includes: 67MM Vivitar Filter Kit (Ultraviolet UV, Circular Polarizer CPL, Fluorescent FLD) + Filter Carry Pouch + Tulip Flower Lens Hood + Snap-On Lens Cap w/Cap Keeper Leash + MagicFiber Microfiber Lens Cleaning Cloth. Quality optical filters for protection and image enhancement..
Includes a padded protective pouch for safe storage and travel.. NOTE: This Kit is compatible with all 67mm lenses. Please verify your camera's lens thread size before ordering. Your camera's lens thread size will be marked somewhere on the lens barrel or printed underneath your lens cap. This number is always preceded by a "Ø" (diameter) symbol. For example: Ø67 = 67mm lens thread size.. Backed with Digital Goja 90-Day 100% Satisfaction Guarantee.. 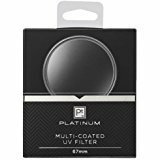 DESCRIPTION:67MM Altura Photo Professional Photography Filter Kit (UV, CPL Polarizer, Neutral Density ND4) for Camera Lens with 67MM Filter ThreadThe Professional Photography Filter kit by Altura Photo includes three of the most useful filters available for your camera kit. Protect your lens against scratches, remove unwanted glare and reflections, and control your exposure and depth of field in bright light. Whether you are a beginner, advanced shooter, or whether you take stills or video, these affordable and highly useful filters help improve the image quality of the pictures you take.Features:Altura Photo UV FilterThe most important filter you can own. The Altura photo UV filter is a cost-effective solution for protecting your digital lens against moisture, dust, fingerprints, and accidental bumps and scratches.Altura Photo CPLCircular Polarizing filters remove unwanted reflections from non-metallic surfaces such as glass or water. Take richer scenic shots and notice improved clarity in distant objects by cutting through haze and increasing color saturation. Simply rotate the front ring to adjust the desired effect.Altura Photo ND4 FilterNeutral density filters are neutrally gray-toned, and designed to reduce the amount of light passing through the lens. The ND4 filter reduces your exposure by 2-stops, allowing for greater control over depth-of-field.Protective Carry PouchCompatibility:Compatible with all lenses featuring a 67mm front filter thread including:e.g. Tamron 16-300mm f/3.5-6.3 Di II VC PZD MACROe.g. Nikon AF-S NIKKOR 70-300 F/4.5-5.6e.g. Nikon AF-S NIKKOR 18-140MM F/3.5-5.6e.g. Canon EF-S 18-135mm F/3.5-5.6 STMPremium MagicFiber® Microfiber Lens Cleaning Cloth included with your order.Ultra-gentle! Extremely fine microfiber leaves zero scratches, streaks or marks. Safe for all lenses. 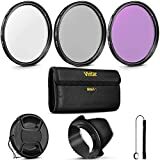 Kit includes: Altura Photo Filter Kit (UV, CPL Polarizer, Neutral Density ND4) for Camera Lens + Filter PouchHigh-quality optical filters for lens protection and image enhancement.NOTE: These Altura Photo product is compatible with all 67mm lenses. Please verify your camera's lens thread size before ordering. Your camera's lens thread size will be marked somewhere on the lens barrel or printed underneath your lens cap. 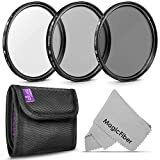 Kit includes: Altura Photo Professional Photography Filter Kit (UV, CPL Polarizer, Neutral Density ND4) for Camera Lens + Filter Pouch + MagicFiber Microfiber Lens Cleaning Cloth. 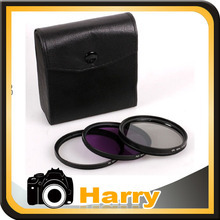 High-quality optical filters for lens protection and image enhancement.. NOTE: These Altura Photo filters are compatible with all 67mm lenses. Please verify your camera's lens thread size before ordering. Your camera's lens thread size will be marked somewhere on the lens barrel or printed underneath your lens cap. This number is always preceded by a "Ø" (diameter) symbol. 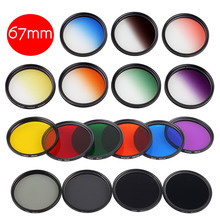 For example: Ø67 = 67mm lens thread size..
67MM Altura Photo Professional Photography Filter Kit (UV, CPL Polarizer, Neutral Density ND4) for Camera Lens with 67MM Filter ThreadThe Professional Photography Filter kit by Altura Photo includes three of the most useful filters available for your camera kit. Protect your lens against scratches, remove unwanted glare and reflections, and control your exposure and depth of field in bright light. Whether you are a beginner, advanced shooter, or whether you take stills or video, these affordable and highly useful filters help improve the image quality of the pictures you take.Features:Altura Photo UV Filter- The most important filter you can own. The Altura photo UV filter is a cost-effective solution for protecting your digital lens against moisture, dust, fingerprints, and accidental bumps and scratches.Altura Photo CPL- Circular Polarizing filters remove unwanted reflections from non-metallic surfaces such as glass or water. Take richer scenic shots and notice improved clarity in distant objects by cutting through haze and increasing color saturation. Simply rotate the front ring to adjust the desired effect. 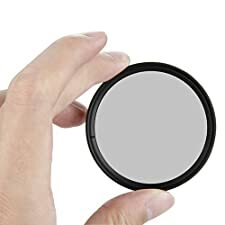 Altura Photo ND4 Filter- Neutral density filters are neutrally gray-toned, and designed to reduce the amount of light passing through the lens. The ND4 filter reduces your exposure by 2-stops, allowing for greater control over depth-of-field.Protective Carry PouchCompatibility: - Compatible with all lenses featuring a 67mm front filter thread including:- e.g. Tamron 16-300mm f/3.5-6.3 Di II VC PZD MACRO- e.g. Nikon AF-S NIKKOR 70-300 F/4.5-5.6- e.g. Nikon AF-S NIKKOR 18-140MM F/3.5-5.6- e.g. Canon EF-S 18-135mm F/3.5-5.6 STMPremium MagicFiber Microfiber Lens Cleaning Cloth included with your order.Ultra-gentle! Extremely fine microfiber leaves zero scratches, streaks or marks. Safe for all lenses. 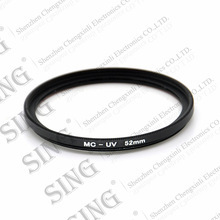 The 67mm UV Haze Filter is a general use, clear filter that helps to absorb ultraviolet light. Noadditional coloration or contrast is provided, allowing you to pair this filter with others.The 67mm Tulip Lens Hood Shade prevents image-degrading lens flare by blocking straylight from striking the surface of the lens. It also assists in keeping moisture or wind-blown debris off thelens as well as protecting the front barrel from the inevitable impacts against walls, door frames, and other real-life obstacles.The UV filter is also useful as a general protective filter to leave on lenses at all times. 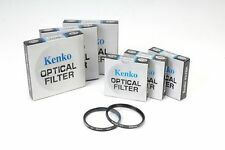 Filters help toreduce dust and moisture from reaching your lens element and provide additional protection in caseof drops or situations where scratching could occur.filters are multi-coated for reducing flare, ghosting, and reflections on the filter surface. As aresult, over 97% light transmission is possible, providing you with additional contrast and high colorfidelity.The UV filters are constructed from high quality, heat-resistant, high-transparency optical glass anda precision milled low-profile aluminum frame.• Absorbs UV light, which can cause outdoor photos to appear hazy and indistinct• Clear filter provides no additional coloration or contrast, allowing you to pair this filter with others.• Works as general protection filter to reduce dust, moisture, and scratches from reaching lens elements.• Multi-coating help to reduce flare, ghosting, and reflections on the filter surface for greatercontrast and color fidelity. Greater than 97% light transmission is possible, providing additional contrast and high color fidelity.• Crafted from high quality, heat-resistant, high-transparency optical glass and a precision milled low-profile aluminum frame. 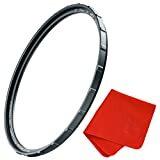 67mm Accessories KIT For 58mm Lenses and Cameras Included is a 67mm 3 Piece Filter set containing a UV Filter, CPL Filter and FLD Filter + a 67mm Hard tulip shaped lens hood + HeroFiber ultra gentle cleaning cloth. Both 67mm Filter kit and the 67mm lens hood are compatible with all Lenses and Cameras with a 67MM Lens Thread. NOTE: Please verify the size of your lens thread prior to purchasing 67mm Lens Hoods are compatible with the following lenses and ALL Lenses and Cameras with a 67mm Lens Thread.CanonCanon EF 70-300 F4-5.6 IS II USMCanon EF-S 18-135mm F3.5-5.6 IS USMCanon EF-S 10-18mm f/4.5-5.6 IS STMCanon EF 70-200mm f/4L USMNikonNikon AF-P Nikkor 70-300mm F4.5-5.6E ED VRNikon AF-S DX Nikkor 18-300mm F3.5-6.3G ED VRNikon AF-S DX Nikkor 18-140mm f/3.5-5.6G ED VRNikon AF-S Nikkor 70-200mm f/4G ED VRNikon AF-S Nikkor 28mm f/1.8GNikon AF-S Nikkor 85mm f/1.8GSonySony FE 85mm F1.8Sony FE 24-70mm F4 ZA OSS Carl Zeiss Vario Tessar T*Sony FE 28-70mm F3.5-5.6 OSSSony E PZ 18-200mm F3.5-6.3 OSSand all Lenses and Cameras with a 67mm ThreadHEROFIBER CLOTH - Included is a HeroFiber ultra gentle cloth that is specially designed to clean electronics and accessories. 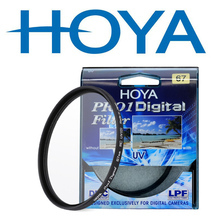 The digital filter kit includes three multi-coated 67mm filters, including an ultraviolet (UV), circular polarizer (CPL) and neutral density (ND) filters. Also included are a filter carrying case, lens cap and lens cap keeper. Compatible lenses include Canon 18-35mm, 17-85mm, 70-200mm f/4, Nikon 16-85mm, 18-105mm, 35mm f/1.4, Pentax 16-45mm f/4.0, 17-70mm f/4.0, and 50-135mm f/2.8. X2 UV (Ultra Violet) FILTER: The X2 UV filter features critically sharp AGC glass made in Japan, MRC8 and our state-of-the-art nanotec nano coating layers which help to eliminate flaring, ghosting and low contrast. Our modern coating chambers are airtight, producing a uniform coating visible to the human eye when holding the filter at a right angle to a direct light source.. ELIMINATES VIGNETTING: The X2 features a 3.5mm ultra-slim double-threaded traction frame to eliminate vignetting on wide-angle full-frame setups. In our lab tests, 4.3mm was the frame width at which point vignetting becomes noticeable on 16mm wide-angle setups on full-frame setups. Any less than 3.0mm and lens caps don't have enough surface area to grab onto. At 3.7mm vignetting is entirely eliminated..
NANOTEC: In addition to state-of-the-art MRC8, our optical engineers developed new nano-coating layer technology, called nanotec, from the ground up to repel dirt, water and other elements by beading rather than absorbing and smearing. Set in our completely weather-sealed X2 traction frame the X2 UV was built to withstand the harshest of environmental conditions..
DOUBLE-THREADED & LASER ENGRAVED: We laser engrave lettering into each X2 UV traction frame to ensure that the lettering won't ever fade or come off after consistent use. We also engrave each and every X2 traction frame with a unique serial number..
25 YEARS SUPPORT: We stand behind every UV filter we make with our 25 Year Ironclad Guarantee. Every X2 UV filter has a unique serial number laser engraved on the interior frame. When you activate your 25 Year Ironclad Guarantee, we assign this serial number to you, so any future discussions on this unique filter are tracked, issues recorded and all that stuff which goes into future product design..
67mm X2 UV (Ultra Violet) Filter For Camera Lenses - Breakthrough Photography The X2 is our gold standard UV for the discerning professional photographer. Featuring high-quality AGC glass from Japan, MRC8 and our water and dust repelling nano coating layers, the X2 is incredibly durable and resolves critically sharp. The moment you pick up the X2 UV you'll immediately feel the craftsmanship and quality. We precisely machine each X2 traction frame from environmentally friendly aluminum, and with its matte black finish reflections are absorbed rather than reflected into the lens barrel. One of the problems with the flat black design is that it's sometimes difficult to attach and remove the filters from the lens, frequently binding and getting stuck. By CNC machining texture into the X2's aluminum frame it's now easier than ever to get on and off, without getting stuck. Benefits: Our state-of-the-art 8-Layer Multi-Resistant Coating process hardens both optical surfaces, reduces reflections and achieves true color neutrality while maximizing contrast fidelity. In addition to being structurally harder than the glass itself, our MRC coating increases light transmittance and prevents common flaring, ghosting, low-contrast and all the rest. 25 Year Ironclad Guarantee with US-based Phone and Email Support. Features: 67mm Thread Size Capture Critically Sharp Images: 8-Layers of State-of-the-art Multi-Resistant Coating Repels Dirt and Water: nanotec Nano Coating Layers Eliminates Vignetting: 3.5mm Ultra-slim Traction filter CNC machined from Aluminum Ultimate Protection: Completely Weather-Sealed Item includes: 1 x 67mm X2 UV Filter 1 x Lens Cloth Click on Buy now button for complete your purchase! Kit Includes: 67MM Vivitar Filter Kit (Ultraviolet UV, Circular Polarizer CPL, Fluorescent FLD) + Filter Carry Pouch + Tulip Flower Lens Hood + Snap-On Lens Cap w/Cap Keeper Leash + MagicFiber Microfiber Lens Cleaning ClothQuality optical filters for protection and image enhancement.Includes a padded protective pouch for safe storage and travel.